So, what is My Biggest Whiskey Regret? About 3 years ago, approximately 12-18 months before his death, my sister @Maddie called me up and told me that if I drove up to Baltimore that I could meet Lincoln Henderson at a tasting at a liquor store. I decided not to go because I didn't like his Angel's Envy and didn't want to put myself into the position of either having to tell him I didn't like his whiskey or pretend that I did when I did not like it at all. As it turns out @Maddie wound up having Lincoln Henderson all to herself for about 45 minutes of chat and tales of whiskey distilling. Boy I would do that one differently if I had that decision to make again! A rough day for Angel's Envy. I actually enjoy the 80 proof stuff as a social drink I can carry around at a party, but i do agree with your assessment of 80 proof wild turkey with a winey nose. I don't consider this to be a bad thing. Score wise I think we are close to the same page. I don't see a way AE breaks past 80 points. It is all nose and not much else. Maybe I should add to your regrets and send you a sample bottle of my AECS. On the subject of finishes do you have your tasting notes of the port (high west midwinter night dram) and caracao (willet xcf 1.0) finished ryes or the last of the sherry finished Jim Beam masterpiece that I brought to the whiskey summit? Perhaps there is a reason that "finished" bourbons are so taboo. I've yet to find one where I consider the finish to be an improvement. I've avoided the new $100? Jefferson's rum finished bourbon for the same reason. If distilleries want to experiment, maybe we could get some different barrel charring methods. Barrels charred by burning peat inside of them, or smoked corn? If EH Taylor Cured Oak is any indication, some extra effort put into the barrels themselves could make a huge difference. @newreverie, thanks for joining in. I wish I did have detailed tasting notes on those three whiskeys which you mentioned among the many whiskies of yours which we tried in Albuquerque. Those three were certainly each very interesting and unusual. Whiskey experimentation in the US is proceeding at a rather feverish pace, both by the small distillers and by the large ones. The small distillers are looking for any hook to make their products different, distinctive, and, hopefully, competitive in the marketplace. The bigs are pressured by the smalls to keep on their toes, and keep in the vanguard of product development. 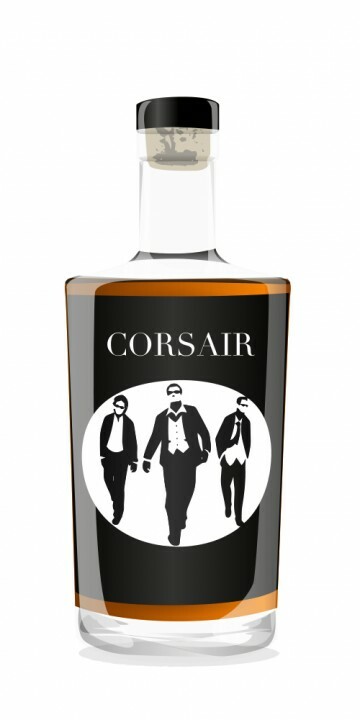 And then there is someone like Darek Bell of Corsair Artisan Distillery who pretty much lives in the creative experimental lane. He has systematically broadened the range of the whiskey world. Happily, in the US there are not the same strangling restrictions on what one does in the name of whisk(e)y as exist in the UK. As we know well, with experiments, some work well, some work a little, and some do not work at all. I don't care for every one of the new products I encounter, but I am very happy that all of this product development and experimentation is taking place. After spending several months over this bottle I am still puzzled as to my final judgment. Undoubtedly, this was a quality bourbon to begin with and I am uncertain what was actually gained by finishing it in port barrels. This bourbon had a high rye content and I think that the port influence was just too much for that grain: spices were very muted and the fruitiness in the whiskey is due to the port, not so much to the rye. Perhaps with a less heavy rye mash bill this might have turned out differently, but I most likely will never find out as my Angel's Envy experimentation will probably end with this bottle. Nose: Definitely a quality rye-heavy bourbon with all the grain, oak and caramel you would expect - but with a bit of a twist: a vinous, dark fruit (raisins-prune)overtone due to the port conditioning. Palate: Incredibly light, smooth and juicy. Winey. Some light spices mid-palate are washed away by the port. Finish: Very long finish which is dry and vinous (a bit too vinous in fact). @jerryclyde, one more time your taste and mine are very similar. You have bought one more bottle of Angel's Envy than I am ever likely to buy. For me rye grain (or wheat grain for that matter) usually doesn't work well with any wine influence. Wine can easily ruin a perfectly good bourbon. Angel's Envy is an excellent example of a bourbon-plus-wine that I just don't like. I find the Port influence on Angel's Envy to be very drab and not at all tasty, or even interesting. Angel's Envy bourbon probably would not rate even 80 points for me. Lots of people like Angel's Envy a lot though. I won't compete with them for the bottles. Bourbon with Port that works for me are the two Abraham Bowman Port Finished Bourbons, 8 and 12 years old. Most of the time, though, I think that adding wine to bourbon is a step backwards. One regret I have in hindsight: because I dislike Angel's Envy Bourbon, I passed up an opportunity my sister pointed out to me to meet Lincoln Henderson in Baltimore, about a year before he died. I didn't want to be in the position of either having to tell the man I didn't like his bourbon, or to pretend that I did, when I did not. As it turned out my sister had Linc Henderson all to herself at a liquor store to chat with, for about 45 minutes. He went into great detail discussing the effects of the barrels on the whiskey, etc., with her. If I had it to do again, I would definitely have made the drive to Baltimore. Some opportunities are not at all obvious at the time at which they present themselves. This is one of the oddest bourbons i have ever had, light but spicy with a nice candied fruit feel and easy drinkability. Easy to drink but not something i will get again. I prefer something dry like wild turkey, still give it a try it is lighter than i am used to. I tried it again still not dry but i got chocolate dipped raisins, and a nice caramel to remind me i was drinking bourbon. Extreme recommendation i dont get chocolate raisins in bourbon only in the red wines i enjoy. still avoid if you dont like lower proof bourbon's. If you get the chance have it at a bar or with a friend before you buy it. One of the coolest bourbon bottles around, complete with wings on the back. I really like the way this bourbon is finished in port. That is a nice extra touch. Taste: Cherry again, imitation vanilla, maple syrup, sweet white corn on the cob, apricots. Finish: Fake cherry syrup, caramel, quince preserves. I was a little disappointed with this bourbon. It features the same heavy chemically derived "cherry" flavor that is a bit overwhelming in most good bourbons such as Maker's Mark. In less expensive bourbons, this cherry flavor goes sour and bitter. That, thankfully, is not the case with Angel's Envy. My take on bourbon is this: most of them, with the exception of wheat bourbons, taste more similar to each other than single malt scotches, which have infinitely more variation. Then again, I am biased: I favor scotches. They agree more with my stomach and general constitution. More than three glasses of bourbon during the course of an evening invariably will make me feel a little nauseated and weak the next day. Not so with scotch. I can drink 3-4 glasses through the course of an evening and feel fine the next day. In my mind, I equate the next day blues with that sickly sweet cherry flavor, and so this has gradually turned into a slight dread of it since I associate nausea with that flavor and smell. Angels Envy, while better than most, is also typical of this cherry flavor, despite the fact that it is finished in port wine barrels. Most reviews of bourbon do not even mention the cherry flavor because it is so ubiquitous. Rittenhouse rye is a notable exception, as is Bernheim, which is wheated. I like Rittenhouse and would go out of my way to order a glass in a bar. The cherry flavor is more like stewed prunes in a Moroccan chicken dish. Just fine and "deeper" in flavor than the grating high pitched ubiquitous fake cherry that reminds me of cherry flavored soda, which is often made from chemical ingredients designed to imitate the flavor of cherry (badly). The only thing worse than fake cherry flavor is fake water mellon flavor, which tastes absolutely nothing like real water mellon to me. If Angel's Envy were served to me, I would gladly drink one glass but no more. I will never buy a bottle of it again, but, this said, I will save this bottle. It's way cool. It's funny that you cite Rittenhouse, as that is the ONLY bottle in my cabinet (off the top of my head, at least) where a cherry note has stood out at all. For me though, the cherry in Rittenhouse 100 Rye is integrated really nicely with the various rye and wood spice notes so that it comes across to me like a soft cherry turnover cookie. Though, as you alluded to, this note was much more prominent when the bottle was first opened a little over a year ago. All that being said, as I go back through the bourbon portion of my cabinet in the next little while I'll search to see if a cherry like note appears. For me, the ubiquitous bourbon note in most bottles (especially all wheaters, and younger ryes) is variations of orange/orange zest. I'm not saying there is anything artificial or chemically derived in this bourbon. I am merely expressing my opinion that the flavor REMINDS me of artificial cherry additives. It is my opinion that this bourbon is generally over-rated and underwhelming. First off, I'm a sucker for Port, Rum, and Madeira finished whisk(e)ys. The Balvenie 21 PortWood, Balvenie 17 year Madeaie, Balvenie 14 year Caribbean, and Bushmills 21 year all made me curl up in my chair and smile : ) Adding this pleasing finish to a bourbon is genius. The nose is immediately sweeter than most bourbons. It's somewhat similar to Woodford Reserve, if I remember correctly. The palate is extremely smooth, but the port influence doesn't detract from the bourbon profile at all. It surrounds it with a velvet blanket. Rye is at the forefront with the woody, earthy, and spicy flavors following. The port boosts the fruit profile quite nicely and provides this whiskey with a touch of elegance. Thank you Lincoln Henderson! I had a bottle of this mailed to me by a good friend because it is currently not available in GA but is coming in 2013 I am told. What an idea to finish bourbon in port barrels...why didn't I think of that! What starts as most certainly a great bourbon is made all the better by resting in select port barrels. As another reviewer said it is tailor made for a good cigar after a great steak! Almost a dessert in itself, Angel's Envy, comes with just enough strong bourbon feel to keep the bourbon traditionalists respecting it. Angel's Envy better get ready because I suspect there will be some more port finished bourbons coming in the next few years but I suspect none will better Lincoln Henderson's inaugural foray. It’s about time I posted my notes on this one, as I’ve been meaning to for a long time. A bourbon. yes, but not any bourbon, but a very special one : finished in Port casks after being aged in fresh oak casks, as bourbons should. As for the name, we all know about “Angel’s Share”, that percentage of the liquid the angels take for themselves in exchange for maturing the liquid, which is about 5% percent per year. After tasting his creation, Lincoln Henderson reckoned that the angels might have wanted a bigger cut. Thus, Angel’s Envy was born. Actually finishing a bourbon is not something done everyday, and when discussing this with fellow whisky geeks, the questions arose, if a bourbon finished in Port can actually be called Bourbon. As it happens, it surely can. good to know. Nose: Sweet. Very sweet. Coconut chips, vanilla , maple wood, wood varnish and honey liquor. Not forgetting spices mainly cinnamon and the odd note of Mushrooms and balsamic extract. This is interesting stuff! Palate: Big entry. Feels much stronger than it 43.3% ABV! Sweet juices, coconut , vanilla and quite some wood. Touches of sweet desert wine , wood bark, cinnamon and burnt sugar. Finish:Maple wood , vanilla and coconut chips. A very rich, and rewarding dram, certainly great for sipping after a meal, or with desert. I’d say it would go very nicely with a good cigar as well. This is Great stuff, really enjoyable. Would love to try that one at Cask strength, 60 something percent, it should be wonderful. Good work guys! Currently it’s available only in the USA as for as I know, and we should really ask for this stuff to be imported as well! @galg, thank you for a very lovely review. I've had Angel's Envy several times. A lot of people like it. It does not work for me, at all. It is the wine finish I don't like here. For me this port finish is too deep and gravelly. For my palate, it is extremely difficult to mix wine flavours with either rye grain flavours(here)or wheat flavours, and get something that does not clash. If offered to drink, and not for resale, I would take one bottle of Parker's Heritage 10 yo Wheated Bourbon, Fifth Edition, with a Cognac Finish, over 10 bottles of Angel's Envy. But I expect that you will get more fans for this than not. @galg, I do love the wine finishes, with barley whisky. I think that wine works with barley and would probably also work with corn, because they have recessive flavours. Rye and wheat are so aggressive in flavour compared to barley and corn that the risk of clashing is quite high, at least for my palate. But yes, a lot of people do indeed already like this Angel's Envy. And a lot of people are not as sensitive to that sense of clash of wine flavours with rye and wheat that I am. @galg, your love for the whisky is expressed in your reviews. It is a pleasure to read them. Not singing from the same hymn book, legendary Master Distiller Lincoln Henderson has flipped the bourbon spiritual paradigm in a new direction by offering Angel's Envy. Aged in new oak charred barrels 4-6 years and finished 3-6 months in port barrels, this is a first in bourbon world. With angel wings displayed on the bottle and appropriately on the "spirit" side of the classy cork top, the buzz has been flying high in anticipation of this unique bourbon. Confession made that this review was tasted neat and hand warmed in a 12 oz. snifter. Nose: Creamy caramels in vanilla, minty, macerated bowl of very ripe summer fruits or berries. Oak and port wine seep hand in hand from the beautifully balanced sweet aromas. Palate: Lightly spiced with those vanilla and caramel cream notes surrounded by hints of cocoa, mint, currants and port in a lightly oiled smooth package delivered with ease. Finish: A little peppery buzz on the tongue which lingers within this medium length finish that sustains those porty, oaky notes throughout my attentive tasting ritual. Non-chilled filtered, this is a delightful new arrival for whiskey world enthusiasts. A very enjoyable and smooth experience which is sure to encourage more distillers to search and pray for their "angels" to arrive and join this heavenly party. Definitely a bottle that will likely have a steady presence in my cabinet. With rumors of a cask strength expression to be released near the end of 2011, I will be on my best behavior to savor this tough to find bottle in preparation for my next. Pass the collection plate! @markjedi1 thanks for the comment and the pun is appreciated in the "spirit" of my review. @Victor thanks for the appended info about Mr. Henderson. As for the 10/10 reference, the original release date was planned for 10/10/10 but Lincoln declared the whiskey not ready for bottling. Thus the initial release date passed but with the name of the expression remaining as 10/10. The corks are unique as they have "expression 10/10" burned into the circumference of the cork with the angel wings logo on the "spirit" underside of the stopper. Regarding the distillery where this expression was sourced seems to be a well kept secret with some speculation that it came from a distillery where Lincoln was involved. Lovely to see an early review of Angel's Envy, very much looking forward to this hitting the UK.